New camera, switching from Canon EOS to Sony. It’s been about 5 years since my last camera purchase (Canon EOS 1dx review) and whilst the 1dx has been faultless since the day I bought it, recently I have been getting a bit fed up of carrying 2×1 series EOS cameras around with me on jobs. The weight was becoming a bit of an issue. I’ve been using Canon EOS cameras since 1989, with a few years of enforced Nikon use when I was a press photographer, however, I have now swapped systems and am using Sony mirrorless cameras. I have traded in all my Canon gear and purchased a Sony a9 with a Sony a7ii as a backup body, along with some fantastic Sony lenses, 24-70GM F2.8, 70-200GM F2.8, Zeiss 16-25 F4 and a 85mm F1.4GM. 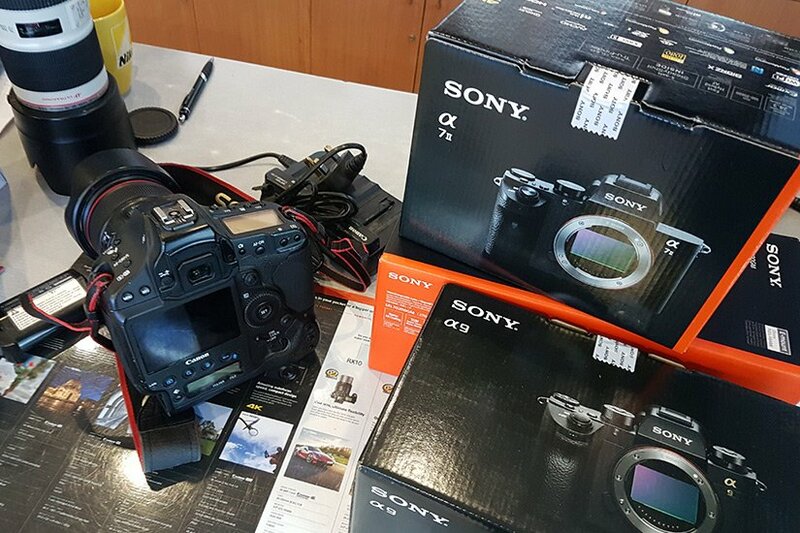 Sony really have hit the ground running with the a9. At their first attempt they have made a camera which rivals, and surpasses in some respects, the 1dxmk2 and Nikon D5. Whilst I’m not writing a camera review, hopefully this will help any other photographers thinking of making the switch. • Lighter to carry, after a days shooting my shoulders don’t ache as much, the grip is well worth getting as it makes portrait images easier to capture. Battery life is also excellent. • The eye tracking autofocus system is incredible, makes framing images a lot easier and quicker. • Autofocusing generally is better than my 1dx, it locks on pretty much first time, even when it’s nearly dark. • Viewfinder takes a while to get used to but after a while you don’t even notice it’s a screen you are looking at. • Lenses are as good as the Canon versions, although the zoom is the wrong way round when compared to Canon’s, no problem if you are coming from Nikon. • The silent shutter means no more shutter noise, something I think I’ll be using a lot during conferences and some of my medical work. • Never thought I would say this, it’s good to have physical dials back, a lot quicker than pushing buttons to change drive speeds, AF modes etc. • Tilting rear screen means overhead and very low shots are now easier to capture, still miss the days when you could take the viewfinder off a Nikon F4 though. • I don’t often use on camera flash, but when I do I’ve purchased a couple of Godox TT685S Speedlite flashes. They are as well made as the Canon versions, and at £94, a bargain. • Finally, something I’ve wanted for years, when tethering with Capture One; I can now write the files to both the internal sd card and computer at the same time, worth the cost of switching alone. • It’s an almost perfect camera, hopefully a future a9ii will address these shortcomings. • Lack of proper weather sealing means Sony will never compete fully against the Canon and Nikon flagship models. As I work in a lot of factories and spend a fair amount of time shooting outside, time will tell how well the camera holds up to our Northern European weather. • No access to menus when writing to the sd cards, hopefully a firmware update will solve this problem. • Still not 100% sure about the longevity of SD cards, I’m having to treat them a bit gentler than cf cards. • Flash contacts look a bit flimsy, I will have to treat my Elinchrom transmitter very gently. In conclusion, very happy so far, will update this post after a few more months with the camera. I’ve been using the a9 for about 6 weeks now and switching has not been without a few problems, but overall I’m finding the a9 has changed the way I am taking pictures. • The eye tracking AF is amazing, it means there is no more AF, re-frame, shoot , repeat. It locks on, and stays locked on, making re-framing quicker and easier. Never thought I would use continuous AF for portraits. The AF is very, very good in low light. • I’m still struggling with the Sony menu options. Camera manufacturers need to look at how Android or iOS organise their menus. I have customised a few buttons and use the mymenu option for the ones I use the most, but why not have a football/swimming/athletics etc pre programmed settings for the AF so I can switch quickly between shooting options. The menu looks like something we used 10 years ago. • Shooting tethered via Capture One and writing to card and PC I’m finding there is a delay in the images showing up on the laptop. Not sure if it’s lack of processing power or no USB3 on the camera. In 2017/8 a flagship camera should really have USB3. https://www.edwardmoss.co.uk/site/wp-content/uploads/2017/12/switchcanontosony.jpg 200 300 Ed Moss https://www.edwardmoss.co.uk/site/wp-content/uploads/2019/01/logo25.png Ed Moss2017-12-07 17:16:292018-11-02 09:14:22New camera, switching from Canon EOS to Sony. Every few years some new equipment comes along that’s worth getting excited about. Since moving from Quantum QFlash to Elinchrom Quadra lighting a couple of years ago I’ve struggled to get a proper solution to shooting above 1/250th outdoors. Quantum Qflash (X5) worked OK up to 1/8000th with the pilot and co-pilot but Elinchrom didn’t have a good Skyport solution, so I had to use the Pocketwizard flex/mini hack, which wasn’t a very practical solution when shooting on location and was only good up to 1/2000th with the Canon EOS 1DX, and even then it did band towards the lower half of the frame, meaning more post processing. Last week Elinchrom released their new transmitter, the HS, below is a quick test at 1/5000th at F2.8 using the Quadra hybrid S head. Up to 1/8000th I can’t see any banding, looking forward to using it in the next few weeks on location. Another plus is that you can see the flash power output from the camera, less trying to see round corners what each flash is doing. Well done Elinchrom! Anyone want to buy a Pocketwizard Flex and Mini for Canon? Just taken delivery of my new 2013 Mac Pro. Specification is quad core 3.7 with Dual AMD FirePro D300 graphics cards, 256GB PCIe-based flash storage and 32gb 1866MHz DDR3 ECC memory which will replace my mid 2010 Mac Pro upgraded to a GTX 570 graphics card/16GB RAM/SSD boot drive. My library has been moved to a CalDigit T3 external Thunderbolt drive configured in Raid 1, the 3rd drive I’ll be using to store my RAW files on. This replaces the 2 internal hard drives I use in my old Mac Pro, nice thing I like about the CalDigit is that you can use it in a combination of Raid, Raid+JBOD or JBOD. Master library as before is stored on a Drobo S, as well as another drive stored off site. Out of the thousands of tests, Geekbenk, Ciniebench, Barefeats to mention a few, I haven’t seen many that use real world applications aimed at working photographers, there are lots of mentions of iPhoto, but I don’t know of any photographers who use it professionally. First test is seeing how much speed increase I get using my primary RAW processor, Capture One. Using Capture One version 7.2, the speed increases are welcome, although not unexpected when comparing technology which is over 4 years old. 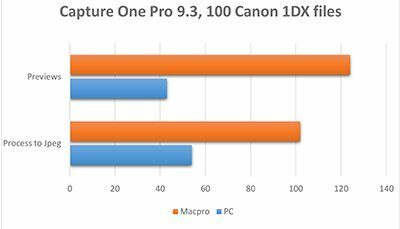 I understand, from Phase One, that Capture One is currently been updated to take full/better use of the D300 graphics cards and to fix a few bugs with the new Mac Pro. I’ve had a few random files come out purple/green when using Open CL on Auto. The difference the GPU makes is remarkable and I’m looking forward to see how much time is saved with the next version of Capture One. Next test will be panorama stitching, followed by lens correction and resizing in Adobe Photoshop CS6. Worth mentioning that after I installed Photoshop I had an old problem come back where Bridge wouldn’t load start up scripts, this was easily solved by renaming my external drive, it was called library and Bridge was looking for them in there, not in my user library where the startup scripts are saved. Stitching 11x9mb Jpegs in Photoshop CS6. This is a feature I use most weeks, CS6 does a really good job of stitching files together, the image below was taken last week at a corporate event in Wales, 11 files were stitched together. The 2013 mac pro is 26 seconds faster, if I ever update to Photoshop CC (not likely) then I would expect the stitching to be even quicker, as newer versions become more optimised for dual GPU’s. Final set of tests using Photoshop CS6, lens correction and contact sheet tools. Lens correction using built in profile for Canon 24mm F2.8 II and contact sheets were processed to A4 300dpi. Lens correction was 24 seconds quicker and contact sheets were 34 seconds quicker, quite a good saving when I’ll be processing 600+ files.